Dorsett was on the field for five of a possible 76 snaps on offense in Monday night's 25-6 win over the Bills. Analysis: Dorsett was not targeted in the game and his opportunities in the Patriots offense figure to remain limited as long as Julian Edelman, Josh Gordon and Chris Hogan are healthy and available. He is however, a player to keep in mind if the team's wideout corps takes a hit for any reason, given that Dorsett has proven capable this season when handed expanded workloads. Dorsett logged eight of a possible 64 snaps on offense in Sunday's 38-31 win over the Bears. Analysis: Dorsett caught his only target for eight yards in the game. His opportunities in the Patriots offense figure to remain limited as long as Julian Edelman, Josh Gordon and Chris Hogan remain healthy. Dorsett, who was on the field for three of a possible 78 snaps on offense in Sunday's 43-40 win over the Chiefs, was not targeted in the game. Analysis: Dorsett's dramatic dip in playing time Sunday corresponded to fellow wideout Josh Gordon seeing a major uptick in snaps (63) in his third game with the Patriots. Looking ahead, Dorsett figures to see limited opportunities in the team's offense as long as Gordon, Julian Edelman and Chris Hogan remain healthy. Dorsett played 42 of the Patriots' 69 offensive snaps and caught all three of his targets for 25 yards in Thursday's 38-24 win over the Colts. Analysis: Though Dorsett logged a healthy snap count in Week 5, he wasn't exactly a high-priority target for quarterback Tom Brady. 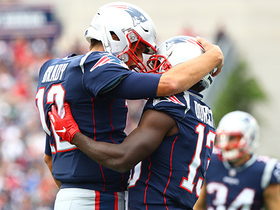 With Julian Edelman back from his suspension and Josh Gordon likely to see more snaps in the coming weeks, Dorsett profiles as merely a speculative fantasy option in a Patriots passing attack with plenty of mouths to feed. 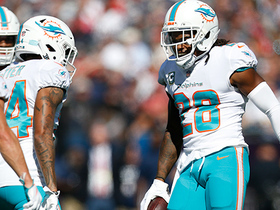 Dorsett brought in four of seven targets for 55 yards and a touchdown in the Patriots' 38-7 win over the Dolphins on Sunday. Dorsett (knee) wasn't listed on Wednesday's injury report. Analysis: Dorsett was dinged up on a hard fall late in Sunday's loss to the Lions, but he's evidently fine and looks ready to go for the Week 4 matchup with the Dolphins. After being held without a catch in Week 3, Dorsett is merely a speculative fantasy play at this juncture, especially with newcomer Josh Gordon (hamstring) a candidate to make his Patriots debut versus Miami. Dorsett sustained a knee injury on a hard fall late in Sunday's loss to the Lions and required a series of tests Monday that included an MRI, but he's expected to be available for the Patriots' Week 4 matchup with the Dolphins, Jeff Howe of The Athletic reports. Dorsett was on the field for 45 of a possible 48 snaps on offense in Sunday's 26-10 loss to the Lions. 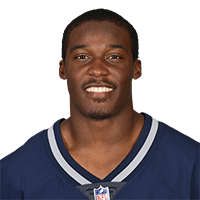 Dorsett was on the field for 56 of the Patriots' 61 snaps on offense in Sunday's 31-20 loss to the Jaguars. Analysis: In doing so, Dorsett caught five of his seven targets for 44 yards. That marks back-to-back seven-target games for Dorsett, who continues to see added opportunities while Julian Edelman serves a four-game suspension. With Edelman still out for two more weeks, Dorsett remains on the fantasy radar as this coming Sunday night's tilt against the Lions approaches. Dorsett nabbed all seven of his targets for 66 yards and a touchdown during Sunday's 27-20 win over the Texans. Dorsett, who caught all four of his targets for 36 yards in Friday's 25-14 preseason loss to the Panthers, appears on track to begin the season as a key cog in the Patriots' passing attack. Analysis: With Julian Edelman slated to serve a four-game suspension to start the season and Jordan Matthews, Malcolm Mitchell and Kenny Britt all having been let go by the Patriots, snaps opposite entrenched starter Chris Hogan are available out of the gate. At this stage, Dorsett appears on track to open the campaign as the team's No. 2 wideout, a context that carries with it some sleeper potential. Dorsett caught all four of his targets for 36 yards in Friday's 25-14 loss to the Panthers in the third preseason game. Analysis: Dorsett's four receptions all came from Tom Brady, which supports the notion that he could find himself in the starting lineup to begin this season. Of course, that would come while Julian Edelman is suspended the first four games, but Dorsett has nonetheless done a good job of advancing his stock so far in his second season with the Pats. Dorsett could have a path to consistent snaps on offense early in the season following the release of fellow wideout Kenny Britt (hamstring), Mike Reiss of ESPN.com reports. 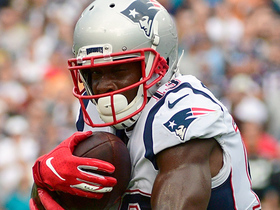 Analysis: With Julian Edelman set to serve a four-game suspension to start the season and Jordan Matthews, Malcolm Mitchell and Britt all having been cut by New England, Dorsett now finds himself with a chance to start opposite Chris Hogan in Week 1. 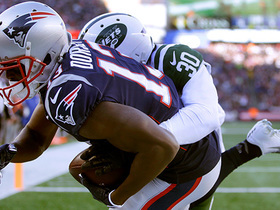 Cordarrelle Patterson and Eric Decker are also on hand to earn targets, and the Patriots may choose to add another wideout, but for now, Dorsett's potential to emerge as a sleeper appears to be growing. Dorsett nabbed one of three targets for four yards during Thursday's 37-20 win over the Eagles. Analysis: Dorsett was catchless in the preseason opener against Washington and dealt with an undisclosed injury this week. 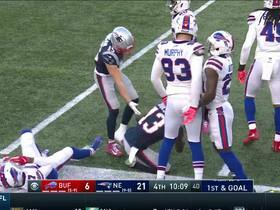 He still made it onto the field for New England's opening drive. The Patriots' receiving corps is a question mark for the first quarter of the season while Julian Edelman serves his suspension. Dorsett's next-level speed brings a unique element to the group, but it remains to see if he can be a difference-maker for the Patriots. Dorsett (undisclosed) is in uniform for Thursday's preseason game against the Eagles, Kevin Duffy of MassLive.com reports. Analysis: Though it's unclear how much work he'll see in the contest, it looks like the wideout's Tuesday injury was a minor one. While Dorsett didn't make much of a splash during his first season with New England, the 2015 first-rounder does have the speed to be a viable receiving threat (along with starting wideout Chris Hogan) out of the gate, if he's able carve out a steady role during Julian Edelman's upcoming absence. Dorsett appeared to suffer an injury toward the end of Tuesday's practice, Kevin Duffy of MassLive.com reports. Dorsett was held without a catch on two targets in Thursday's preseason opener against Washington, though he did get the start at wide receiver along with Julian Edelman, Mike Reiss of ESPN.com reports. 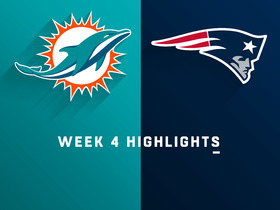 Analysis: It was a bit surprising to see Dorsett get the start over Chris Hogan, who finished with two drops on two targets, per ESPN.com's Doug Kyed. Hogan still figures to serve as the team's No. 1 wideout in Edelman's absence duringthe first four weeks of the regular season, while Dorsett seems to have an early leg up for the No. 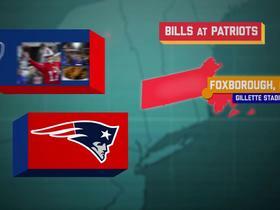 2 job over Kenny Britt (hamstring), Eric Decker and Cordarrelle Patterson. Dorsett has impressed early on in training camp, ESPN's Mike Reiss reports. Dorsett isn't a lock to make the 53-man roster, ESPN.com's Mike Reiss reports. In the aftermath of the trade of Brandin Cooks to the Rams on Tuesday, Dorsett "probably elevates to the title of fastest Patriots receiver," according to Mike Reiss of ESPN.com. The Patriots don't figure to pick up the fifth-year option on Dorsett's rookie contract, ESPN.com's Mike Reiss reports. Dorsett finished the 2017 regular season with 12 catches on 18 targets for 194 yards in 15 games. Dorsett caught three of his five targets for 26 yards in Sunday's 26-6 win over the Jets. Analysis: The speedster saw added snaps Sunday, with Chris Hogan (shoulder) still out, but that didn't translate into a significant statistical impact. With Hogan on track to return in the postseason, Dorsett figures to remain off the fantasy radar unless additional injuries hit the Patriots wideout corps. Dorsett, who was on the field for 25 of 60 snaps on offense in Sunday's 27-24 win over the Steelers, caught his only target for four yards in the contest. Analysis: Dorsett saw added snaps Sunday, with Chris Hogan (shoulder) out, but that didn't translate into much added production. The speedy wideout remains off the fantasy radar unless additional injuries hit or a scenario exists in Week 17 where the Patriots have nothing to play for and elect to rest key players. 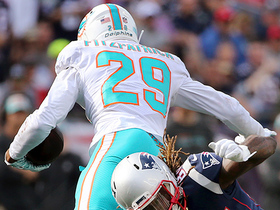 Dorsett did not see any snaps on offense in Monday night's 27-20 loss to the Dolphins. Analysis: The return of Chris Hogan (shoulder) to the lineup Monday squeezed Dorsett out of the mix, confirming that he's fourth in the team's wideout pecking order behind Brandin Cooks, Hogan and Danny Amendola. Dorsett is thus off the fantasy radar, and it will probably stay that way unless additional injuries hit or a scenario exists late in the season where the Patriots rest key players. Dorsett likely will see his role decline with Chris Hogan (shoulder) expected to return for Monday's game in Miami, Phil Perry of NBC Sports Boston reports. Dorsett, who was on the field for 48 of 70 snaps on offense in Sunday's 23-3 win over the Bills, was not targeted in the contest. Analysis: With just seven catches on 11 targets for 140 yards through 12 games to date, Dorsett is off the fantasy radar. It figures to take additional injuries (wideout Chis Hogan is currently ailing) or a scenario late in the season where the Patriots rest key players for that to change. Dorsett was on the field for 43 of 70 snaps on offense in Sunday's 35-17 win over the Dolphins. Analysis: Dorsett continues to see added playing time with Chris Hogan (shoulder) sidelined, but his target share remains modest. On Sunday, Dorsett parlayed his lone look into a 39-yard gain, and looking ahead he remains off the grid in most formats, with so many other pass catchers drawing more of QB Tom Brady's attention. 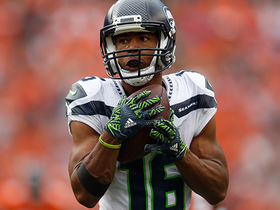 Dorsett was not targeted in Sunday's 33-8 win over the Raiders. Analysis: With Chris Hogan (shoulder) still sidelined, Dorsett was on the field for 28 of a possible 60 snaps on offense Sunday, but QB Tom Brady was obviously far more locked in on wideouts Brandin Cooks and Danny Amendola, who were both targeted nine times in the game. Whether Dorsett continues to see added snaps Week 12 hinges on the status of Hogan, but at this stage the former Colt is not a reliable fantasy lineup option, with just six catches for 101 yards in 10 games to his credit in 2017. Dorsett logged a season-high 49 snaps on offense (out of a possible 70) in Sunday's 41-16 win over the Broncos, ESPN's Mike Reiss reports. In the process, he caught both of his targets for 16 yards. 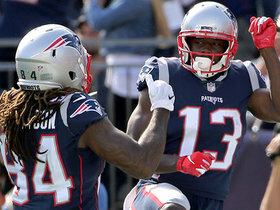 Analysis: As expected, with Chris Hogan (shoulder) out Sunday, Dorsett saw an expanded role in the Patriots passing offense, but he wasn't able to parlay the added work into a fantasy-worthy effort. Whether that might change next weekend against a more giving Oakland pass defense largely hinges on the status of Hogan, who is a candidate to remain sidelined in Week 11. With Chris Hogan (shoulder) out Sunday against the Broncos, Dorsett figures to see an expanded role in the Patriots' Week 10 passing offense. Analysis: Dorsett hasn't seen much in-game work of late, but with Hogan sidelined, he's a candidate to start on the outside opposite Brandin Cooks, while Danny Amendola maintains his slot role for the Patriots. The last time the team was without a key wideout (Amendola in Week 2), Dorsett caught all three of his targets for 68 yards, thus making the 2015 first-rounder worthy of a fantasy dart for those scrambling for help at the position in deeper formats. With wideout Chris Hogan (shoulder) looking unlikely to play Sunday against the Broncos, Dorsett could see an expanded role in the Patriots' offense in Week 10, Jeff Howe of the Boston Herald reports. Analysis: If Hogan is sidelined, Dorsett would be the leading candidate to start on the outside opposite Brandin Cooks, with Danny Amendola maintaining his slot role. Per Mike Reiss of ESPN.com, Dorsett has been on the field for just 19 percent of the Patriots' offensive snaps this season, netting four catches for 85 yards. It's worth noting, however, that the last time the Patriots were without a key wideout (Amendola in Week 2), Dorsett caught all three of his targets for 68 yards.